If you are looking for a way to recycle plastic or aluminum coffee cans, consider turning them into birdhouses. Even children as young as 2- and 3-years old can work on this project. Only minimal cutting is required to prepare the can to serve as a birdhouse and ready the can for hanging. Prepare the cans and let children decorate them to give to their mothers for Mother’s Day or give to other family members as gifts. Scrub the insides of each can with soap and water to eliminate the strong coffee odor, as the scent will repel birds from building inside the can. You may have to rinse and rewash the cans several times before you can remove all or most of the coffee scent. Turn the coffee cans up on their tops, so that the bottoms are facing upwards. Use a hammer and nail to puncture two holes into each coffee can bottom; these holes will be used to attach the coffee can birdhouse to a tree or wooden post. Turn the coffee cans up on their bottoms with the lids still attached and facing upwards. Use the utility knife to cut a hole in the very center of each lid. The size of the opening will allow different-sized birds inside the coffee-can house; a golf-ball-sized hole is ideal for most songbirds. Smooth down the rough edges along the hole by sanding with sandpaper or melting the edges slightly with a cigarette lighter. Removing these rough edges will prevent the birds from cutting themselves accidentally as they enter and exit the birdhouse. Cut two slits measuring ¼-inch long into the coffee can lid using the utility knife, approximately ½ inch below the birdhouse opening. Make the two slits cross one another in an X shape and slide the wooden dowel inside to make a perch for the birds. Invite the children to decorate the exterior of the birdhouse with acrylic paint and stickers. Once the children finish painting, allow the paint to dry and then spray on a clear coat of polyurethane to protect the paint from fading and the birdhouse from rusting. 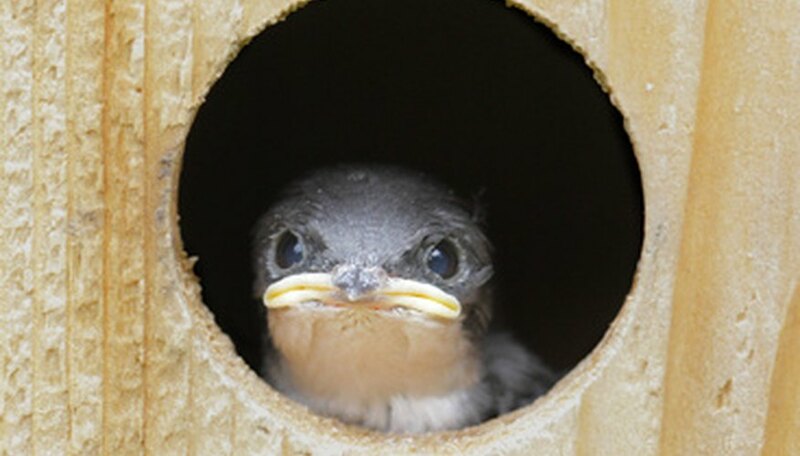 Remove the lid of the coffee can birdhouse once a year to remove old nests and make room for new occupants.